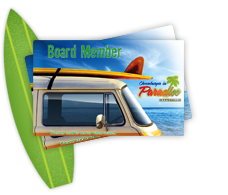 Our Board Member Club is a FREE reward loyalty program that gives you points for dining at Cheeseburger in Paradise. Points can be redeemed for appetizers, desserts, merchandise and Tickets to Paradise! At your next visit, inform your server you want to join the Board Member Club. You will receive a swipe card at the end of your meal and the server will swipe your card to be awarded for that evening's purchase. Every time you dine in one of our restaurants you will receive one point for every dollar spent. These points can be redeemed for awesome discounts in the restaurant along with various prizes on the website. You will also be e-mailed exclusive offers and fun stuff on your birthday. Make sure to register your Board Member Club card when you first receive it. Registration is fast and easy.